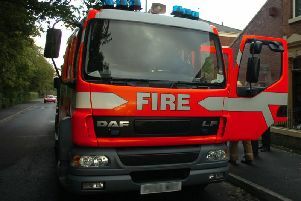 A man and a woman were given a precautionary check by paramedics after a fire at their Chorley home. Firefighters were called to Balmoral Road shortly after 11pm last night after a quantity of bedding was set alight. Smoking is suspected to have been the cause. A man and a woman were helped from the building and given a check-up at the scene. A fire crew using breathing apparatus used a hosereel on the bedding. In a separate incident, firefighters forced their way into a building in Balmoral Road, Chorley, after a cooker fire early today. They found the occupant asleep in the premises and food burning in the oven. He was treated for minor smoke inhalation at the scene.